The Barren Island Volcano sent a plume of volcanic ash and steam toward the northeast over the Andaman Sea on April 5, 2006. The Moderate Resolution Imaging Spectroradiometer (MODIS) flying onboard the Aqua satellite took this picture the same day. 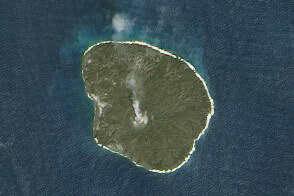 This image shows Barren Island at Aqua’s full 250-meter resolution, available on the MODIS Rapid Response site. 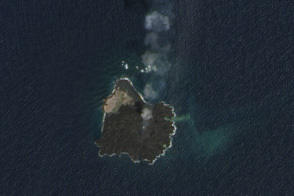 In this image, the volcanic plume dissipates as it moves away from the tiny island. The white dots southwest of the volcano are clouds. 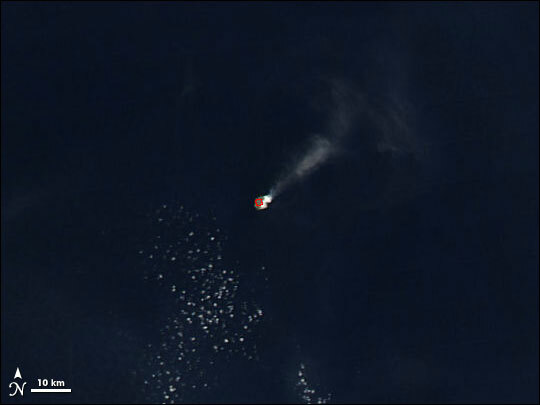 The red outline around the volcano’s summit is a thermal anomaly, showing where the satellite sensor picked up especially warm surface temperatures. Just three kilometers wide, with a two-kilometer-wide caldera, Barren Island is the summit of a volcano that rises about 2,250 meters from the sea floor, poking 354 meters above the water line. About 135 kilometers northeast of Port Blair in the Andaman Islands, the volcanic island is uninhabited. It is the only historically active volcano in the north-south volcanic arc between Sumatra and Myanmar (Burma). In mid-March 2006, news reports assured India’s citizens that the volcano’s activity in early 2006 was no cause for alarm as seismologists surmised that it did not indicate an increased risk of earthquakes.